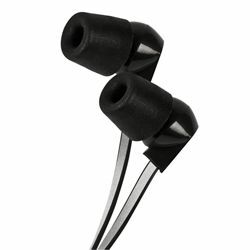 Reflective Earphones add an extra layer of safety when you're on the go! Reflective tape on both sides of the cables is illuminated when hit by light so you can be seen from a considerable distance. The memory foam ear cushions conform to the shape of your ear for maximum comfort. Keeps you visible in the dark. Cable reflective on both sides. Memory foam cushions confirm to the shape of your ear. Adds an extra layer of safety when you're on the go at night.